Do you ever wake up in the morning with a strong desire to start anew in a different place? That urge to pack a bag and buy a one-way ticket to a new city? If you answered “yes” then why don’t you? If you have the resources to do so and there is nothing truly stopping you (I’m talking about all those little excuses people say to stop themselves) then buy that one-way ticket. Wherever you go next in your life I am sure you will be happier. Obviously there’s more to happiness than location but it serves as a setting in your happiness. It’s where you live, where you work, it’s your home basically your city surroundings are a foundation that take part in a lot of your happiness. If you ever feel unhappy or underwhelmed or even confused maybe it’s time to pack up and go somewhere new. It could be as simple as booking a flight or packing up your car and leaving. What if all you needed to clear your head is to play your life out some where new. Perhaps meeting new people, exploring a new place, investing yourself in a new city is what brings your life the boost it needs. Especially right now as millennials and twenty-somethings we are dreamers with goals but are we’re struggling. Don’t worry elders we understand that we have to start at the bottom of the work hierarchy. We’re not stupid. We just didn’t think it was going to be this difficult after graduation. Some of us work a salary job on top of hourly paid jobs to pay off loans, rent and other grown up bills. Some might say it’s irresponsible to want to move somewhere else regardless if we have a well paying job or not. Poo poo on those naysayers because if you think it’ll benefit you more than where you are right now I say go for it. Instead of continuing to say “I wanna move there” “I’ll do it eventually” start making it your reality and make steps towards your big move. Sometimes you have to get in that car or plane or train and just go. Don’t live your life out in a place where you know you don’t belong. That’s the worst. The first time I said “I love you” was over an awkward text message. Generally, this is done face to face but I’ve never been good with timing and I tend to word vomit in these types of situations. 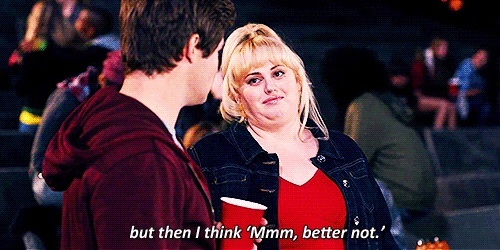 I kept replaying Rebel Wilson’s line in Pitch Perfect on my head after I said it. I meant it as a friend and a lover. The lover part is gone but the love as a friend is still there. I don’t know if I’m ready to be in a relationship yet. I’m still trying to figure out who I am. I mean like I should probably date to get out of my comfort zone. I’m so used to doing things without having to worry about someone else’s feelings. We always joked that one day you would swim away and never come back and you just laughed and said if only. It’s important to know the difference between sacrifice and settling. Sometimes we need things from people that they can’t give us. That doesn’t make us worse for needing them or worse for not giving. I’ve always gone with the go for it tactic. Whether it ends bad or good it was an experience. It’s like diving into the ocean blindfolded. You can prepared as much as you want for the reactions to situations or the future but ultimately it’s out of your hands. Don’t base your happiness off of circumstances. You don’t need everything to be going your way in order for you to be happy. I am happiest outside. Whether it’s in the mountains or sitting by the ocean. It’s where I know myself best. Know that happiness is not a destination. It’s a mood. It comes and goes and that’s okay. That means we can find happiness more often in the little things life has to offer. I’m trying new things. I’m putting my dance background to use and I hope I don’t fall on my head. Every time I fill out a college application I think “why the F am I doing this?” Applications for anything are the worst.